Good morning everybody and welcome and thank you very much Peter for your very kind welcome. I have to say that I’m quite intimidated after those expert introductions and it’s going to be tough going to keep up with the quality of their presentations. However, I have labelled my talk this morning “Back to the future” and the reasons for that will become apparent as I go along in my discussion and presentation to you. The fact is that, as Peter has just alluded to, there is nothing really new about the treatment that I dispense. It is very much old fashioned therapy and I will come to that a little later. But having said that I would like to make a number of acknowledgements. First of all, as I have just said to Peter and his team, thank you very much for having me. It’s a great privilege to be here in this incredible city of Chicago and thank you once again. I’d also like to thank the parents of the children who have taken the trouble to travel long distances to meet with us today. It has taken considerable effort and no doubt expense, so thank you to you all as well. An important element of the Aron Regime has been the Facebook presentations with which you are no doubt quite familiar. And this was an idea compounded by five people initially, four mothers in the United Kingdom and a particular dad, the only dad in the group, Jeffrey Kastner of Springfield, Missouri. Are you here this morning Jeffrey? I would like to mention them by name and they are: Milli Hill, Debra Cambidge, Rebecca Fenby, Sheila Murray, Elaine Richardson, Laura McCabe, Jennifer Cornell, Guzala Shaheen, Silvia Gramuglia and Jeffrey Kastner. Because their input has been promoted by their desire to spread the word in regard to the treatment that I provide because they enjoyed, if that is the correct word, really positive outcomes of the treatment and they wanted other people to join in and share in this particular benefit. So, having said that, I’ve learnt quite a few things on the facebook page and the first is these acronyms “LOL”. Now I thought that all the messages I got with LOL meant “lots of love”. However, my dear wife Kate and more about her later, pointed out to me that it was “Laugh Out Loud” which sort of put me back in my place clearly. Then there’s the apparently simple word “so”. Now this word can mean quite a lot as in “Thank you so much” which means the person is acknowledging the progress and says thank you, which is perfectly normal. Then there’s “Thank you sooo much”. Now that mother has just had two uninterrupted nights of sleep for the first time in two years. So she’s really quite happy about the situation. Then there’s “thank you sooooooo much”. Now that mother is delirious because she has slept for a whole week for the first time in five years. Then there’s thank you as you seen on the screen and that mother was so happy and the message behind that particular “so” is “Dr Aron, I’d like to marry you”. I’ve had quite a few such proposals I’m pleased to say and I’m running them past Kate so far well this has been no problems. Just to give you a rough idea of the statistics of my work over the last year, I’ve seen primarily on the internet approximately 1,000 patients since October last year and the split of the patients is quite interesting because the main group of patients comes from the United States 47%, United Kingdom as you see 33%, Australia, Canada, New Zealand 10 and other countries 10%. And all these patients are coming predominantly from English speaking countries; I do not see patients from other countries, perhaps for obvious reasons. And there’s a very, very important point about these stats because I’ve found that my colleagues in America, with few exceptions, are extremely open to new ideas, thank you Peter. My colleagues in the United Kingdom and in South Africa are much less so inclined to try different things. So I think that’s at least one of the different reasons why America is the great country that it is and it has become. In trying to think recently about my eczema journey on the way to Chicago, I thought for a long time where the road trip began. And I think it began the first day of my first residency at Groote Schuur Hospital and the University of Cape Town in South Africa in 1967. Because in those days you had very, very few products available in our armentarium to treat eczema and other conditions. We had, and probably most of you will have never heard of these products, we had Liquor Picis, Carbonis, a form of tar, we had coal tar, we had emulsifying ointment, we had aqueous cream, we had zinc oxide cream, we had Vioform, a form of antiseptic. Latterly, we got topical corticosteroids and latterly still we got topical antibiotics available. And, as I was going along in my training process, we had to learn how to create mixtures and combinations of these various products. A fundamental aspect of my training was how do you mix what with what to get the best effect. And I have to concede that it was an extremely haphazard process but through trial and error we did manage to make some progress in the management of the condition. However, the real progress was made when I established, I don’t really want to say discovered, but I established that a combination of steroid, antibiotic and moisturising cream was probably the best combination of topical products. And by 2008 my results were becoming sufficiently predictable and sufficiently consistent to enable me to offer the service on an internet basis. Now this was quite a big move for me, being technophobic as I am, but I received an incredible amount of support from my wife Kate who is quite clued up on this whole situation and at this point I would like to acknowledge her place in the promotion of the Aron regime, which I’ll refer to as the AR if I may. Without Kate I would not have been able to do this because she is a management consultant by profession. She has run the whole back office situation and I rather like it because every now and again someone writes to me and says I would like to thank you and your team for what you’ve done and I don’t think they realise that there actually isn’t a team, it’s just me and Kate. She’s also been an incredible liaison officer with the facebook administrators. She knows what’s going on and she runs past me all the information on which I may need to make various decisions. In 2008, I waited eagerly for the registrations to come, the patients were going to pour in. Of the patients pouring in there were none, that in itself was a little bit disappointing. But things changed because one morning Kate and I were watching a breakfast TV programme out of London UK and on the programme there was a young girl of about 14 who was being interviewed and it was quite clear that she had very severe atopic skin disease and I said to Kate, “I can’t understand, why are they interviewing this poor child; she is in absolute distress” and I was incensed because I felt that I would be able to do something about it and when I indicated this to Kate she said “well if you think you can help her, why don’t you do so”. Now, when a man’s wife challenges him in that way the only possibility is, you have to react to it for obvious reasons. So I made a number of calls and managed to get hold of Laura Weaver’s mother and, as luck would have it, Lisa Weaver was and is a state registered nurse in the United Kingdom and the thesis that I presented to her namely with reference to the bacterial component of atopic skin disease made perfect sense to her. So the outcome of that was that I emailed my compounding pharmacy in London, they would FedEx the appropriate creams to in this case the Weaver family and Laura did very, very well on treatment. And then the defining point arrived a little bit later because she went back onto this breakfast programme as a before and after patient. As a result of that, there was an enormous degree of interest in my treatment, there was a link in the programme to my website. And then my practice really took off again in a major way. Subsequent to that, there was further TV exposure, some of you would probably have seen the Carte Blanche medical, which is a South African medical programme which was aired in 2010 and then 2 years after that the website was created by these individuals that I’ve named earlier and when the facebook page went live as you all know there’s been enormous interest in this page and as of this morning we have in excess of 5,000 members in this group. The key interesting point out of this, it indicates and confirms the depth of the problem that atopic skin disease presents to us and I think Peter will agree with that. How to decide on appropriate therapy. The most effective treatment is the one with the lowest risk, the lowest morbidity, and I will comment on that word in my next slide, and the most benefit and you always, in any medical treatment and indeed in any treatment, you do need to balance risk against morbidity and benefit and one of the factors, two of the factors is the economic cost of the treatment in dollar terms and of course in time and input terms as well. Now this is an artificial slide to try and illustrate a point. Let us assume that there are five different methods of, five different accepted methods of treating atopic eczema. And I’ve listed them. And I’m assuming for the purposes of this discussion that in every case the patient is completely healed after 6 months. That’s clearly not the case but for the purposes of this discussion let’s accept that. There is the standard one of topical corticosteroids with the implications thereof and most of you are probably all familiar with that, there’s homeopathy, there’s no therapy at all which just forms a supportive therapy, there’s immunosuppressant therapy which our profession, informed doctors if you like, we seek refuge in that on occasion if all other things have failed and finally there is the AR. Now, morbidity means sickliness, unwholesomeness and the degree of sickness, so obviously what you need to achieve if all these things are equal you want the therapy with the least morbidity, the least itching and with the fewest sleepless nights, the least amount of infection. And I believe that the AR, if you take that particular group of treatment approaches, is probably the best of the batch. Dr Lio referred earlier, there is no single perfect treatment for AEwe are aware of that. So we still have to do the best that we can and going back to regime number 1, the problem with topical steroids is that if you treat with topical steroids and the presence of StaphylococcusAureus infection is not recognised, or if recognised it’s not adequately treated, it results ultimately in what I’m going to touch on a little bit later, the so called red skin syndrome. 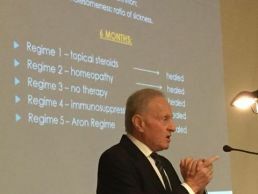 Homeopathy, so many of my patients have sought refuge with homeopathic therapy and the simple thing is had that worked or helped them they would not have come and seen me and so I don’t have confidence in that particular treatment approach. No therapy at all except supportive, there are advocates for this and I understand completely why this is the case. These patients often have gone through the topical steroid approach higher and higher and higher, more and more potent straight steroids without ultimate healing and consequently to draw the logical conclusion that they’re better off doing nothing at all is quite understandable. However, the levels of morbidity in that position are very high and probably around 100%. I do not favour immunosuppressants because there is the question of significant potential for side effects, there’s the question of needle phobia because these children need repetitive blood tests to ensure that liver function, kidney function and white blood cell function is in order and so I think you end up with quite a large batch of needle phobic children eventually. Now everybody knows that the atopic dermatitis affects, I don’t believe in the 30% figure, but I’ve put it up there for the purposes of this talk. I think, as Dr Lio referred to earlier, it’s probably closer to 10-15% and although we do not understand the pathogenesis of atopic dermatitis we do know that there’s an abnormal Immunoglobulin E immune response in the setting of skin barrier dysfunction. And that’s quite an important point because there is some very important work done by Dr Yuni Nakamura and her team and what they established was this: Staphylococcus Aureus secretes a delta toxin. This poison damages or destroys the mast cells of the skin. Mast cells release, if you like, histamine or poisonous granules and that causes the skin to itch and burn. Consequently, I’ve come to the conclusion, rightly or wrongly, on an observational basis not an evidence-based basis, that if you knock out the Staph Aureus that whole cycle is going to be reduced and the patient is going to be very much better and quite quickly. Because at a recent conference in Durban, South Africa, Dr Elizabeth Hollam, an esteemed dermatologist out of Denmark, she made a very interesting point and she said that in laboratory testing, Fucidin cream, fusidic acid which is the topical antibiotic which I believe will become available in the United States some time next year, in contact with the Staph Aureus, kills the bacteria within 3 hours. And that is why those of you who have seen very dramatic responses to my mixture, it’s accounted for by the elimination of the bacteria at a stroke by the mupirocin in this country and fucidic acid in others. And that is why I really believe so much in the antibiotic element to the treatment. This is the technical side which I’ll just read through for you very quickly. Mast cells contribute to Immunoglobulin E mediated allergic disorders including atopic dermatitis. The mast cells release their membrane bound cytotoxic granules and that is the damaging thing as they say here the importance of the pathogens in AE. And here is an absolutely frightening point, 90% of patients with AE are colonised with Staph Aureus. The delta toxin is the devil in this particular product and several Staphylococcus exotoxins, with delta toxin the prime one, act as super antigens in models of atopic dermatitis and that’s quite important in one or two of the points that I’m going to come to in a moment. The topical antibiotics, these are just the names of the two that are available, and I do want to touch on the controversial subject and in, with regards to this controversy everybody is perfectly entitled to their point of view, I’m not here to prophesize, I’m not here to change anybody’s mind, I’m simply here to present to you my thoughts, for what they are worth, in regard to red skin syndrome, railtrack atrophy, topical steroid withdrawal syndrome. I’ve labelled this particular section “Out of leftfield” and I would like you to know that I know a little bit about baseball and I in fact, in Atlanta the other day, went to watch the Braves versus the Phillies and in both of them after that the Braves clipped the Phillies 2 to 1. Red Skin Syndrome. The reason that this occurs is, and I did allude it to you earlier, I do not think that this is a syndrome, I think it’s a sign of failed topical corticosteroid therapy meaning steroid number 1 is chosen, there is short term benefit from use of the drug, on cessation of that treatment there is a flare up of the condition and then, quite understandably, the physician or the dermatologist or the allergist or the pediatrician will prescribe a stronger steroid. That goes on and on and on until eventually the steroids have no further effect and the skin is defusely red and that to my way of thinking is simply a sign of Staphylococcal infection which has not been treated, not a syndrome. Topical steroid withdrawal syndrome, another controversial issue which is quite interesting because in the end I don’t believe that you can be addicted to topical steroids in the same way that if a patient is being treated for diabetes or being treated for hypertension (high blood pressure), if you stop the therapy in those conditions or you inadequately reduce the therapy you will get a flare up in the same way that you get flare ups with eczema. In other words the sugar levels in the blood would increase, the blood pressure will go sky high once again and I have to say that those patients as not addicted to anti-hypertensive or to anti-diabetic drugs and therefore I don’t think either that eczema patients are addicted to topical steroids, I simply believe that the steroid could be used in a more appropriate and a more effective manner. However, those are my views on that and the term that I’ve coined here is railtrack atrophy, and railtracks, as you know, run parallel and usually do not meet. On the dermatological side, we believe less in allergy than perhaps we might. On the allergy side, I think the allergists and the pediatricians put too much emphasis on the question of allergy and not enough on the question of infection. And that is why we run parallel and do not often have points leading one to the other. Now having said that, what I’ve found, once again this is not evidence-based, it’s observational-based, that if you clear the Staph Aureus it is quite remarkable how many of the allergies disappear. And in these children, or adults for that matter, these are not allergies. The skin is so reactive and it’s so sensitive that almost anything they contact is considered to be a trigger factor and many of them aren’t. Now this is not to say that children are not reactive to grass for example, to eggs, to wheat, and so forth. Many of them are. And perhaps the allergists need to take on board a little bit more of the Staph side of things and we dermatologists mustn’t neglect or ignore the question of specific allergies. And the next trap here is, if your child or if a child has high levels of Immunoglobulin E, so called IgE, the allergists would immediately say aah this child has multiple allergies but they do not realise perhaps that IgE is also increased by skin bacterial infection. And this particular slide on your screen, I’ve drawn your attention to the fact that the reference is dated 2001, that’s 14 years ago and we are still not looking adequately or aggressively enough at secondary skin infection. We’re looking too much at the allergic side. Now I’m going to end my talk before, I’ll be happy to answer any questions that you may have, and in the 18th century there was an English poet called Oliver Goldsmith and he wrote a pastoral poem called “The Deserted Village” and he described this idyllic life in an English village and long as the pastoral poem went along the highly respected and dearly loved creature died and was replaced by a new man. The publication was highly skeptical and highly suspicious of this man not at all happy with his presence. However,” truth from his lips prevailed with double sway and those who came to scoff remained to pray”. Thank you very much for your attention this morning. Good morning.